If you have pastures or hay fields, weeds will always be an issue. Good fertility and grazing management will go a long way towards keeping weeds in check and these factors should be evaluated and addressed as a means of weed prevention. However, chances are that from time to time it will become necessary to use herbicides to control problem weeds. There are many excellent herbicides available for use in pastures and hay fields. Thankfully, when selected and used correctly, these products are an economically sound way to control most of our problem weeds. Caution: the general effectiveness of these herbicide products can cause producers to become somewhat nonchalant when it comes to management decisions surrounding their use. As an Extension Agent, I often get the call or text, “What’s best for killing (insert problem weed here)?” There needs to be much more to the conversation than the desired one or two-word answer. Herbicides are a management tool, and their usage should be based on their ability to add value to your operation. Selecting the wrong herbicide for the job or applying a product in a manner that limits its efficacy virtually guarantees a negative economic impact. Some recent conversations I’ve had with experienced pasture managers have reminded me that we can all stand a reminder on how to maximize the efficacy and overall value associated with our usage of pasture/hay field herbicides. The following are a few key principles to help you maximize the value realized out of your herbicide program. If you don’t know exactly what weed(s) you are trying to control, planning and delivering an effective herbicide program is nearly impossible. No single herbicide controls all weeds. To even begin selecting the best herbicide option for your situation you must know what weeds you are trying to control. Even if weed identification doesn’t excite you, don’t skip this step in the process. Your County Extension Agent is available to help you through the entire process, including weed identification. After you have identified your problem weeds you can begin to determine what products will provide effective control. Be careful, not all pasture herbicides are safe for all types of pasture grass. This consideration requires that you understand what your forage base is composed of. Bahiagrass, bermudagrass, and crabgrass are all common warm season forages in NW Florida and they each tolerate various herbicides differently. To further complicate matters it is not unheard of for all three of these species to be growing intermixed in the same field. If you are controlling weeds in broadleaved forages (perennial peanut, clover, etc.) 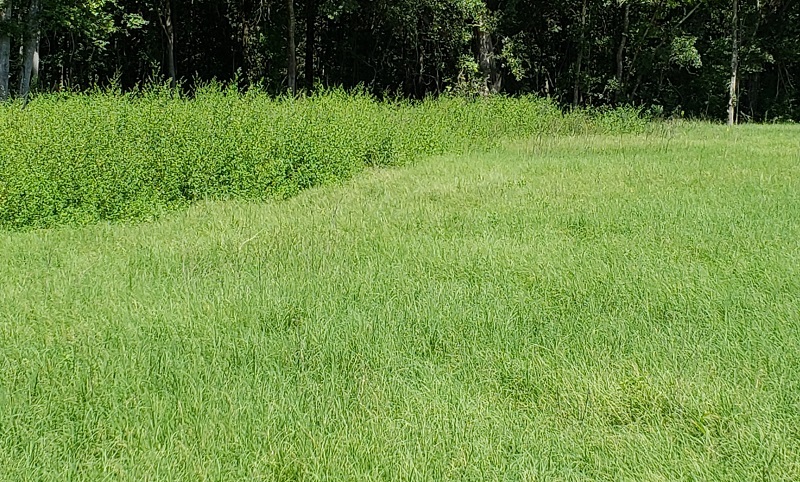 forage tolerance is a huge concern – very few pasture herbicides can be used safely on broadleaf plants. Failing to consider forage tolerance to herbicides can be a very costly mistake. Herbicide injury can cause substantial production loss or even complete stand loss. Many of the most effective pasture herbicides have a residual component. This means that the product will continue to provide herbicidal activity for an extended period (this varies product to product and with environmental conditions) after its initial application. Generally, this characteristic serves to enhance weed control, but it can cause significant issues when not properly accounted for. Commonly, these potential issues are addressed on herbicide labels as “plant back restrictions” or the amount of time after the application of an herbicide until it is safe to plant various crops in the treated area. Crop rotations have made row-crop producers accustomed to paying close attention to plant back restrictions. Livestock and hay producers more commonly operate with a perennial forage base. However, residual herbicide issues can arise when warm-season pastures are over-seeded with cool-season annual forages. Many common, summer applied, pasture herbicides can potentially damage fall planted winter annuals. After consideration of the three points above, it is possible to determine what product(s) are suitable for your situation. Once the suitable options have been identified, product price becomes a key point to consider. Product price should be evaluated in terms of cost per acre, considering application rate. With a known herbicide cost per acre, be sure that forage quantity and/or quality improvement associated with the herbicide application financially justifies the application. Be sure to remember that benefits provided by effective herbicide use can and should last many years. A perfectly selected product applied incorrectly will likely not achieve the desired weed control or financial return. The following are a few considerations to help ensure/improve the efficacy of pasture herbicides. This is by no means an exhaustive list, simply some points that I have commonly and/or recently seen producers fail to consider. More is not always better and less only saves money if the weeds are still controlled. Use the labeled rate. In the event a range of rates appears on the label, see comments below on spray timing. To know you are using the correct rate, your application equipment must be correctly calibrated. Your county Agricultural Extension Agent can help with this process. Always follow label recommendations. That said, generally speaking, herbicide efficacy will be improved by adding 0.25-0.50% (by volume, of the total spray mixture) Non-Ionic Surfactant. This translates to 0.64-0.32 oz/gal of spray mixture or 1qt/50gal – 1qt/100gal of spray mixture. In the big scheme of things, surfactant is inexpensive and is generally always a good investment. Determining the most effective timing for herbicide applications is very closely related to knowing the specific weeds you are facing. It is generally more cost effective to control annual and new (first year) perennials earlier in their growing season. Waiting later into the growing season allows weeds to become stronger and make seed. Weeds may be controlled after seed set (often requiring higher herbicide rates), but in most cases there will be subsequent generations to deal with. Spraying earlier in the growing season also allows for weeds to be controlled before they have a chance to negatively impact that season’s forage production. Timing is even more crucial when it comes to controlling established perennial weeds. The ideal timing varies by species and situation and should be confirmed before spraying. In general, these weeds are most effectively controlled with late-summer/early-fall herbicide applications. Regardless of species, herbicide efficacy is reduced when weeds are stressed at the time of application. Post emergence herbicides (the vast majority of pasture products are in this category) are most effective when applied to “happy,” actively growing weeds. Again, this was not an exhaustive list of the considerations that need to be made prior to an herbicide application; only an attempt to address some of the points I have seen producers overlook this summer. Always read and follow herbicide labels – the label is the law. Herbicides are effective tools that when used properly can have a positive economic impact on your operation. Please take the time to carefully evaluate your situation and make well informed decisions to ensure that your weed control efforts are as successful as possible. For a more in-depth explanation of any of the topics addressed in this article or other questions relating to pasture/hayfield weed control please contact your county’s Agricultural Extension Agent. Weed Management in Pastures and Rangeland 2018 – is also an excellent publication on pasture weed management.